Over the past quarter century, we have lived through the greatest looting of wealth in human history. While billions of dollars streamed into the pockets of a few elites in the corporate and economic class, the vast majority of citizens have lived through a period of falling wages, disappearing pensions, and dwindling bank accounts--all of which lead to the personal debt crisis that lies at the root of the current financial meltdown. 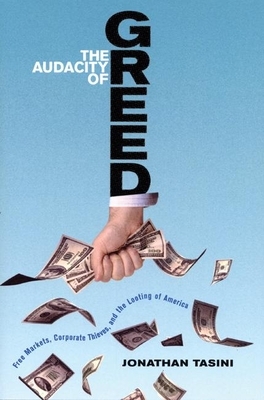 This "audacity of greed" was legally blessed by the ethos of the "free market," a phony marketing phrase that covered up the fleecing of the American public. In The Audacity of Greed, Jonathan Tasini examines the reasons and exposes the people responsible for the looting of America--from Wall Street executives who funded their lavish lifestyles at the public's expense to the politicians who let it happen--arguing that we need a cultural and philosophical revolution that punctures the fable of market fundamentalism and, by doing so, values the contributions made by ordinary Americans throughout the economy. Jonathan Tasini is executive director of the Labor Research Association. The longtime president of the National Writers Union, he was the lead plaintiff in Tasini vs. The New York Times, the landmark electronic rights case that took on the corporate media's assault on the rights of freelance authors. In 2006 he ran against Hillary Clinton for the Democratic nomination for the US Senate in New York. He has written about labor and economics for a variety of publications including The New York Times Magazine, The Washington Post, Los Angeles Times, and The Wall Street Journal, and has appeared on CNBC and Fox News. Jonathan Tasini is the executive director of Labor Research Association. From 1990 to 2003, he served as president of the National Writers Union. In 2006, he challenged Hillary Clinton for the Democratic Senate nomination in New York. He has written about labor and economics for a variety of publications, including The New York Times, Wall Street Journal and LA Times.